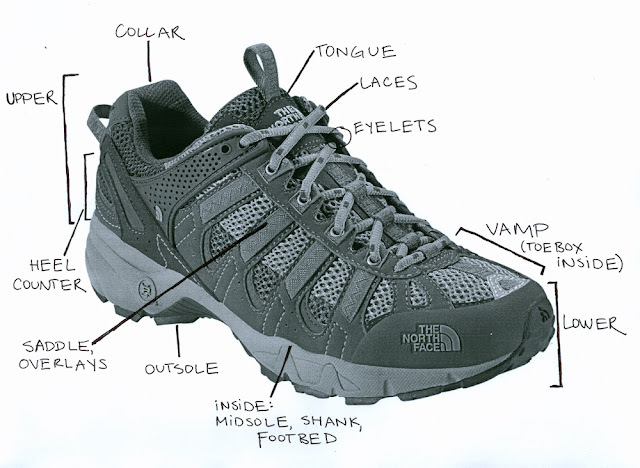 Ma Petite Niche: Running Shoes: Does the shoe Type Matter? 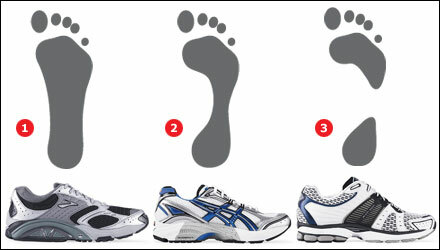 Running Shoes: Does the shoe Type Matter? Now that we are transitioning from winter to spring, am in the market for new running shoes. My previous ones lasted over a year. It had holes and was worn out but I loved it. Every tear or scratch had a memory/exercise story attached to it. They were like battle wounds and give the shoe character. However, when I started feeling the ground beneath while wearing them, reminiscent of "barefoot" running, I knew it was time to let go. So then the question is....Fashion Statement vs Functionality? Cheap vs Splurge? Should you settle for the cheapest shoes you can find or splurge on a brand name pair? The solution is knowing your gait and arch. 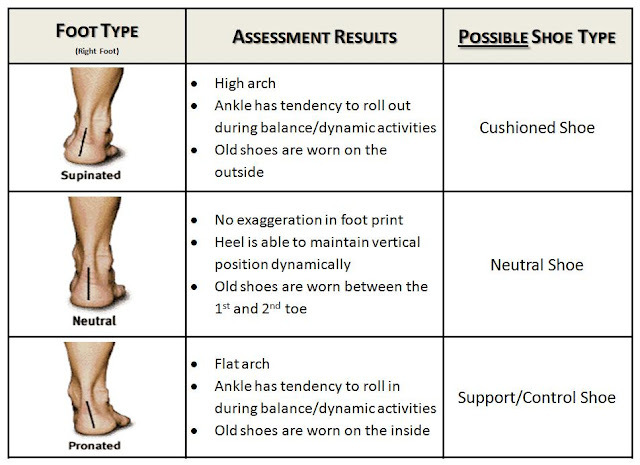 These two components are important in determining what shoe type best fits your foot. 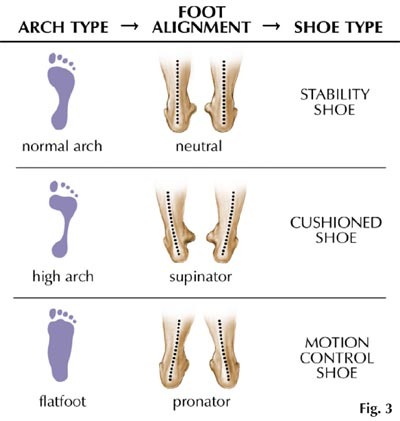 There are 3 types of arch and 4 types of gaits. How do you figure out your arch? Most athletics retail stores can help you figure out your arch and gait. However, you can also do this at home. All you need is a pan, large enough to place your feet flat at the bottom, a paper towel and some water. Place a small amount of water into a pan. Just enough to cover the bottom surphace of the pan. Once your foot is wet, step out of the pan and place the foot on a paper towel to leave an imprint. Repeat this with the second foot. Now use the imprints from the paper towel and compare them to the diagrams in this post to figure out your arch type. Its important to find the right shoes for your foot because it helps prevent injuries and improve your gait. All of which can help improve your athletic performance. 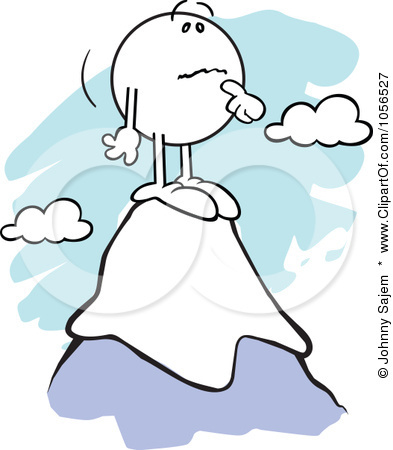 Gait and arch are influenced by physical attributes such as weight body distribution, height and body posture. At the end of the day, running shoes are just a tool. 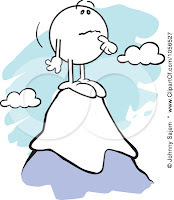 YOU still have to do the work* to meet your fitness goals. Do not believe in advertisements that suggest that a pair of shoes will tone your legs or gluts without any effort on your part.